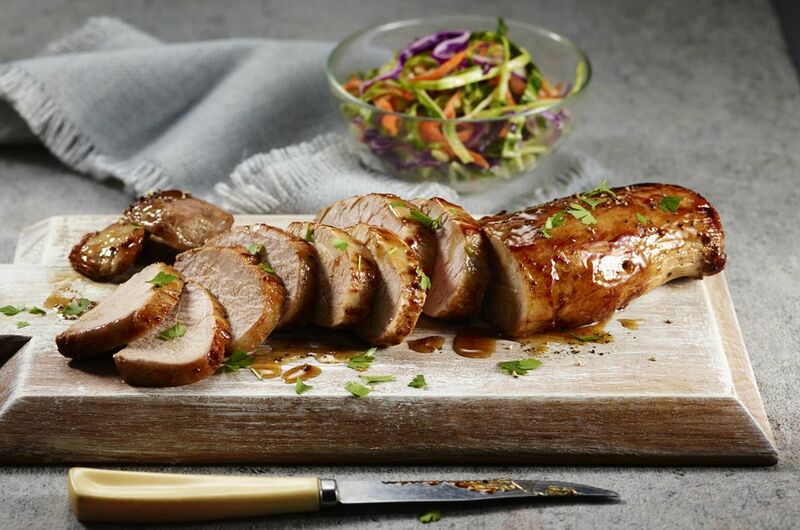 The maple glaze on this pork tenderloin is made with a combination of maple syrup and Dijon mustard along with some vinegar and complementary seasonings. Pork tenderloin is lean, and since it is mild in flavor it benefits from a flavorful glaze or coating. Add a little extra maple syrup to the final sauce if you like. Trim any visible fat from the pork tenderloins. Rub the tenderloins with garlic halves, then rub all over with the seasoning blend and freshly ground black pepper. If the seasoning is salt-free, sprinkle with a little salt. In a small bowl, combine the maple syrup, 4 tablespoons of cider vinegar, and the Dijon or brown mustard. Stir to blend thoroughly. Set aside. Melt the olive oil (or 1 tablespoon of butter and 1 tablespoon of olive oil) in a large skillet or saute pan over medium heat. When the oil is hot add pork tenderloins and cook, turning, until seared on all sides, about 6 to 8 minutes. Reduce heat to medium-low, cover, and cook, turning the meat occasionally, until a food thermometer inserted into pork registers 145° F.* This should take 10 to 15 minutes longer, depending on the size and thickness of tenderloins. Transfer pork to platter and cover loosely with foil to keep warm. Add 2 tablespoons vinegar to skillet and bring to a boil, scraping up any browned bits. Reduce heat to medium-low. Return pork to skillet; add maple syrup mixture and turn pork in the glaze to coat well. Cook, turning, for about 2 minutes. Remove from heat. Transfer pork to cutting board and cut into 1/2-inch slices. Taste and season with salt and pepper, if needed. Arrange sliced pork on a platter or individual plates with a sprinkling of green onion tops or chopped parsley, if desired. Spoon some of the glaze over the pork slices and serve with rice, noodles, or potatoes, along with steamed vegetables and Cranberry Chutney or whole cranberry sauce. *According to foodsafety.org, pork cuts must be cooked to at least 145° F. To check the temperature, insert a food thermometer into the thickest part of the meat.